One of the great things about living in Colorado is the snow that falls during the winter. 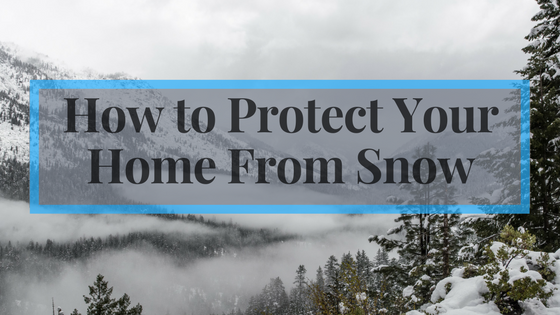 However, this same lure can bring about costly expenses if your home is not protected from the perils that can come with snow. Taking the steps before the damage occurs is the best form of protection against the dangers of Mother Nature. While packed powder might be what you are looking for when hitting the slopes, it can be damaging to your home, which is one of the biggest investments for many people. To ensure that the winter weather does not affect your ability to live comfortably in your home, you will want to keep the snow away from your house. Some ways to address this issue is to shovel snow away from the exterior walls, as well as using a roof rake to prevent the excessive weight of the snow from piling up on your roof. Doing so will also help to prevent leaks in your ceiling when the snow begins to melt. Wind often accompanies winter snow storms, which can make snow removal challenging. Not only can wind blow snow up against your houses’ exterior walls, it can also bring the outdoors in, but not in the way that some people desire. When your windows and doors are not sufficiently insulated against the weather, it can drive snow drifts inside, as well as cold air, which can result in a less than comfortable living environment. Using caulking and weather stripping can help to reduce the chilly drafts that can result from the presence of gaps around your windows and doors. Although most of the slopes are open and running in Breckenridge, your home can still experience a melting of the snow that might have piled up on your roof. When this happens, it can lead to the formation of an ice dam, which can clog your gutters, reducing the ability for the water to run off from the roof. When the warm air of your attic combines with the cold temperatures of the packed snow at your roofline, it can result in the melting of the snow, which then refreezes once the now melted snow meets the cold edge of the roof (also known as ice dams). Due to the large amount of snow that routinely falls in the Breckenridge area, many of the houses do not have effective gutter systems, which can lead to leaks and costly repairs if the ice and snow is able to remain caked on your roof. Some ways to reduce the risk of ice dams include using insulation against air leaks in your attic, ensuring that you have over 8” of insulation, with blown-in cellulose and fiberglass better bets, and adding vents in your roof and/or soffits to assist in the cooling of the attic. An ounce of prevention can lead to a decrease in the likelihood that you will need to complete extensive repairs once the snow season starts, as well as when the last flake falls. If you were not able to get to your outdoor pipes before the snow season started, now is the time to protect your pipes. This can be done through wrapping your pipes with heat tape and covering your outdoor faucets with insulating materials. Ensuring that the exterior of your home is prepared for the next winter snow season can let you keep the chilly temperature outside. Some steps that you can take before the next snow season include using durable paint that can stand up to the harsh winter elements, as well as caulking your windows to reduce drafts, and tending to any siding that may allow the cold weather and dampness through to your interior walls. The off season is also a good time to hire a professional to examine and fix any issues that may make it difficult to stay warm during the winter. The harsh temperatures of the Colorado winter can lead to the peeling of exterior paint, which, in turn, can lead to costly repairs, not to mention cool drafts inside. Through repainting the exterior of your house during the Spring, you will be able to reduce the effects of snow and cold temperatures, allowing you to enjoy worry-free warmth during the next winter season. Taking the steps to insulate your attic, as well as inspecting the exterior condition of your home can help you to protect your home from the amount of snow that is commonly experienced in the Breckenridge area.